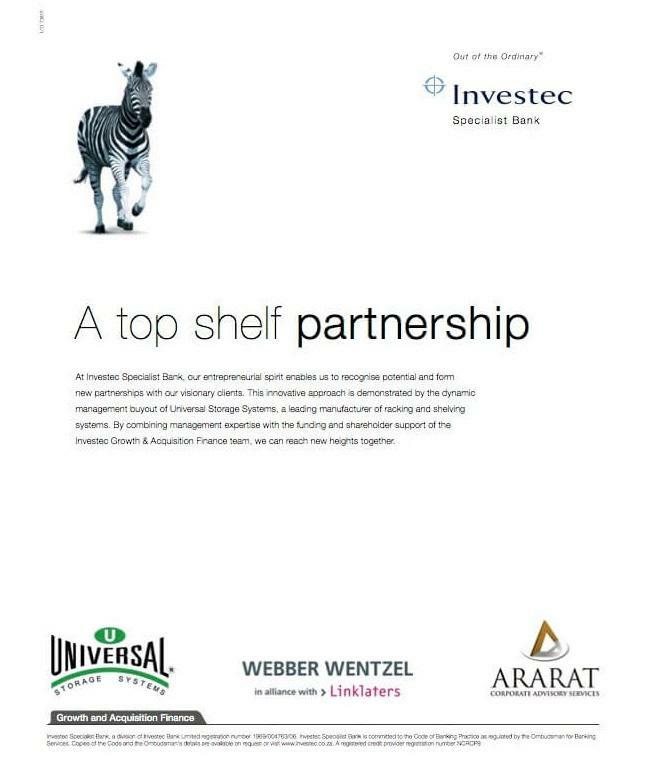 Universal Storage Systems, Africa’s leading manufacturer of industrial racking and shelving, markets a range of warehousing and storage products, and systems. The company, through the use of its own research, technology and highly trained engineers, plus access through international relationships, has a reputation for being able to find solutions to most storage challenges. Serving the Republic through a network of company branches and distributors, Universal Storage Systems has developed a reputation for excellence in South Africa. Today, more than ever before, the demands on efficient material logistics, optimal use of space, maximum flexibility in locating, storing and retrieving stock, continuously push warehousing solutions to new frontiers. Universal Storage Systems has not only recognized the increased expectations placed by its client’s markets onto the shelving and racking industry, but has focused its Engineering and Quality Departments on developing new and improved technical solutions which meet and exceed these demands. Encompassing every phase of storage solution from our SEMA approved designers and Manufacturing meeting SABS ISO 9001 standards, to project management and construction by our team with more than 20 years’ experience we are the leaders in innovation and quality. With our specially made Universal Uni - range we ensure that your storage systems are cost effective, value engineered, of the highest consistent quality and proven durability to optimize your storage capacity. Mezzanine flooring is easily moved and transferred to suit your storage needs as they change or even should you move warehouses. Utilizing a Mezzanine floor will lead to far better efficiency and work flow as you organised your storage or work spaces more effectively. - Parts assembly and storage, picking, packaging materials and offices. -No more waiting for the fire guys to finish installing before you can store your goods. We finish the sprinkler installation as soon as the racking is done! -Short lead times -No more on site painting and manufacturing – No more mess! Our pipes and fittings are epoxy coated for a long lasting perfect finish! From its beginnings as Formrite Storage Systems, the Company has undergone major change and in 1994 simultaneous with a new vision, new logo and the new name Universal Storage Systems, embarked on an internationalization program which has been rewarded with successful and rapid growth. This growth bears testimony to the dedication, skills and experience of Universal’s engineering, production and sales team who, coupled with innovative dynamic thinking and customer need determination, provide product solutions and service which our clients have grown to appreciate.